A Lunar Eclipse occurs about twice a year when a satellite of the sun passes between the sun and moon. This satellite is called the Shadow Object or Antimoon. Its orbital plane is tilted at an angle of about 5°10' to the sun's orbital plane, making eclipses possible only when the three bodies (Sun, Object, and Moon) are aligned and when the moon is crossing the sun's orbital plane (at a point called the node). Within a given year, considering the orbitals of these celestial bodies, a maximum of three lunar eclipses can occur. 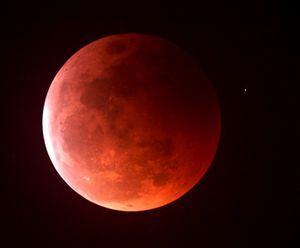 Despite the fact that there are more solar than lunar eclipses each year, over time many more lunar eclipses are seen at any single location on earth than solar eclipses. This occurs because a lunar eclipse can be seen from the entire half of the earth beneath the moon at that time, while a solar eclipse is visible only along a narrow path on the earth's surface. Total lunar eclipses come in clusters. There can be two or three during a period of a year or a year and a half, followed by a lull of two or three years before another round begins. When you add partial eclipses there can be three in a calendar year and again, it's quite possible to have none at all. The shadow object is never seen in the sky because it orbits close to the sun. As the sun's powerful vertical rays hit the atmosphere during the day they will scatter and blot out nearly every single star and celestial body in the sky. We are never given a glimpse of the celestial bodies which appear near the sun during the day - they are completely washed out by the sun's light. Dr. Samuel Birley Rowbotham has provided equations for finding the time, magnitude, and duration of a Lunar Eclipse at the end of Chapter 11 of Earth Not a Globe. There is also a possibility that the Shadow Object is a known celestial body which orbits the sun; but more study would be needed to track the positions of Mercury, Venus and the sun's asteroid satellites and correlate them with the equations for the lunar eclipse before any conclusion could be drawn. As far as the Lunar Eclipse goes, there is no evidence that the shadow which manifests on the moon during a Lunar Eclipse originates from the earth at all. That shadow could come from any celestial body intersecting the light between the sun and moon. The only reason the Greeks and ancients (and modern astronomers) are able to predict the Lunar Eclipses was because the predictions are based on recurring charts and tables of past eclipses. It had nothing to do with the shape of the earth or the actual geometry of the cosmos. The Lunar Eclipse is a phenomenon which comes in patterns. By studying these patterns it is possible to predict when the next transit or eclipse will occur. The astronomer can use historic charts and tables with a few equations to predict the time, magnitude, and duration of a future eclipse. This does not apply only to the eclipse, either: All recurring phenomena such as the transits of planets, occultations of bodies, and precision of paths across the sky are predicable only because they are phenomena which come in patterns. Astronomers predict celestial events by studying the patterns and predicting when the next occurrence will occur. Q. But what about NASA's yearly lunar eclipse predictions? They must be based on a geometric model, and not simply cycles in the sky, surely? A. Actually, NASA freely admits that they use ancient cycle charts for their eclipse predictions. The Saros Cycle and those cobby old ancient methods which simply look at past patterns in the sky to predict the next one is precisely how "modern theorists" predict the lunar eclipse today. The Lunar Eclipse is red because the light of the sun is shining through the edges of the Shadow Object which passes between the sun and moon during a Lunar Eclipse. The red tint occurs because the outer layers of the Shadow Object are not sufficiently dense. The Sun's light is powerful enough to shine through the outer layers of the Shadow Object, just as a flashlight is powerful enough to shine through your hand when you put it right up against your palm. The globular earth is said have a circumference of 24,900 miles while the atmosphere is said to extend only 100 miles around it. If the RE model were true, and the redness of the shadow was caused by the sun's light filtering through the earths atmosphere, then the earth's shadow upon the moon would only have a slight sliver of red around the shadow's edges. The moon could not turn entirely red as it does in the above image. The fact that the moon turns entirely red during a Lunar Eclipse suggests that the light of the sun is flowing through the majority of the body which intersects the path of light. Clearly an impossibility in the RE explanation. This page was last modified on 22 March 2019, at 15:56.